UPDATED: Mon., Aug. 13, 2018, 1:57 p.m. The heat blanketing the Spokane region didn’t just send us two-legged mammals scurrying for cooler climes. 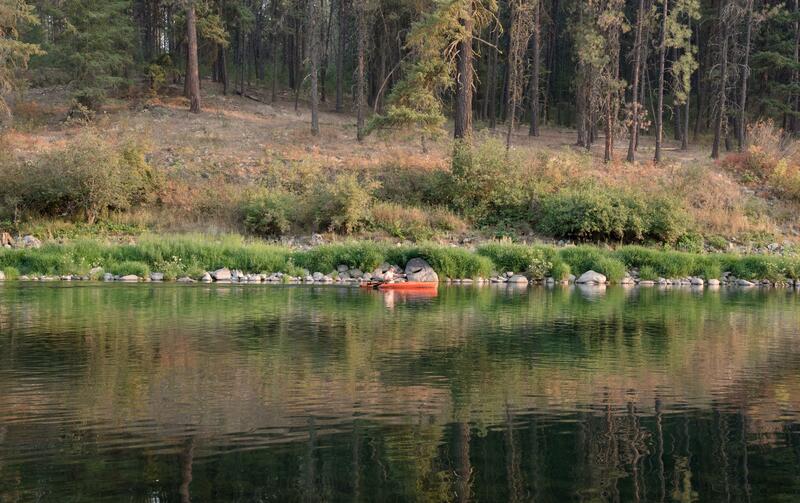 Fish in the Spokane River also sought refuge as the air temperature neared 103 degrees. Luckily for them, and us, they were able to find those cooler currents because of a constant influx of chilled aquifer water bubbling from deep underground. That constant flow of cooled water makes the Spokane River unique, said Jerry White, the Spokane Riverkeeper. The aquifer got redband trout through the “dark ages” of the 20th century, decades where the river was seen as little more than a flowing garbage dump, White said. The clean, cool aquifer water gives fish a break. White has seen the temperature in the upper river reach as high as 75 degrees. Meanwhile, just miles downstream the water temperatures can hover near the 60s, White said. “When the temperature gets nasty up there they will move down and seek some refuge,” said Randy Osborne, the Washington Department of Fish and Wildlife’s Spokane district fish biologist. Most of Washington’s rivers and fish aren’t so lucky. High temperatures can stress and kill native fish, like sockeye salmon. In July, the lower Yakima River became so warm that sockeye salmon were unable to migrate upstream into the Columbia River, according to the Washington Department of Fish and Wildlife. “Temperatures measured in the Yakima River near Prosser have often exceeded 80 degrees during the month of July – similar to conditions found off shore of the Hawaiian Islands. Temperatures above 73-77 degrees are considered lethal,” according to the Washington Department of Ecology website tracking Washington’s water conditions. As of Friday, roughly 50 percent of Washington’s rivers and streams had below-normal flows. Climate change models for Washington predict “extended periods” where the weekly average water temperature in many rivers and streams exceed 69.8 degrees, according to a 2009 publication examining ways state wildlife managers and advocates can address a changing climate. Overall it’s predicted that the Columbia River’s water temperature will increase by one-tenth of a degree per year. These sorts of concerns are part of the reason why in 2006 the Legislature passed the Columbia Basin Water Management Program. The program is aimed at balancing a variety of water needs, whether it’s irrigators, municipal water services or fish, said Joye Redfield-Wilder, a spokeswoman for the Department of Ecology. “High water temperatures are a big deal because we’re looking at restoring and protecting the salmon,” she said. Part of that work involves mapping where fish can go to cool off when things heat up, she said. They also look at how human-made structures impact temperatures. The issue is one of spawning and migration. “We are most concerned about getting these fish to these smaller tributaries where they spawn and where they rear and where they migrate out,” she said. Redfield-Wilder said the collaboration has brought some success. During drought years, for instance, the Kittitas Reclamation District diverted cooler irrigation water out of a canal and upstream into important tributaries, which kept the creeks flowing. “The idea is we’re not going to sacrifice one benefit over another,” she said of the project’s overall aim of balancing interests. WDFW also tries to help fish when streams get shallow or too hot. In 2015 WDFW staff created artificial channels to connect upstream flows to areas of need downstream. The agency also sets fishing and building regulations aimed at reducing fish stress, Carlson said. Occasionally, and in rare situations, WDFW staff will physically move fish. However, increasing temperatures – paired with decreasing snowpack – will continue to put pressure on fish, regardless of what humans do. “The other challenge about low stream flows is it’s easier for predators to access,” Carlson said. Even in the Spokane River, blessed as it is by an aquifer, the trout habitat is not as broad as it once was. “We think those trout used to live up and down the river and now because of the increased heat and the warming climate the trout have to exit that upriver portion and go find thermal refuges,” White said. Compared to the alternative – dying in tepid water – that’s good. But the slow elimination of habitat worries White and others. And it’s not just a problem for the fish or anglers who love catching them. It’s an ecological issue with radiating consequence. That is illustrated by the plight of Tahlequah, the southern-resident orca whale who has pushed the corpse of her newborn baby since July 24. Tahlequah and other members of her pod eat primarily chinook salmon. What WDFW and others are doing is primarily “treating symptoms,” Carlson said. As of yet there is no clear long-term solution. Instead, she hopes increased awareness and communication can lead to a sustainable solution. Due to a reporter error two quotes were attributed to the wrong person. The story has been corrected. Published: Aug. 10, 2018, midnight Updated: Aug. 13, 2018, 1:57 p.m.